Beyond the many promotional benefits and services that come with an annual Visit Hershey & Harrisburg partnership, additional advertising opportunities can increase your visibility and attract even more visitors to your business! Invest in sought-after space in the annual Official Visit Hershey & Harrisburg Travel Guide to reach visitors and guests who have a strong interest in the Hershey Harrisburg Region and its acclaimed dining and shopping offerings, attractions, accommodations, and events. Third-party experts handle all Travel Guide ad sales. They’ll help you analyze the options to determine which ad placement will be most beneficial for your business. Please contact Steve Lassiter from Today Media Custom Communications at 443-909-7828 or by email to get started! Reach visitors before they come to the area. Our Official Visit Hershey & Harrisburg Travel Guide helps them decide where to stay, eat, shop, explore, and be entertained. It&apos;s a valuable planning resource for our guests, presenting engaging stories, special events details, business listings, insider travel tips, and more. 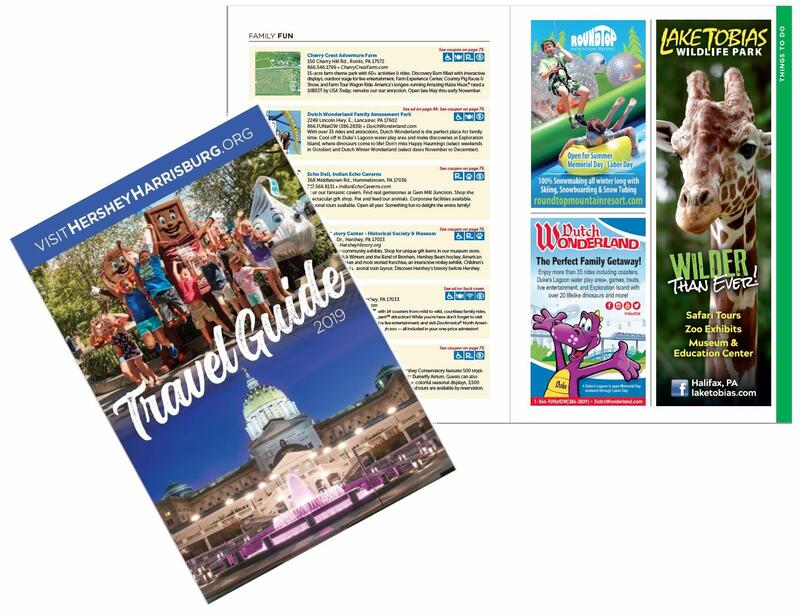 Approximately 275,000 guides are printed and distributed each year to prospective and returning visitors, event and meeting attendees, information centers, tour and travel planners, and AAA and other travel professionals. We have extended readership with an online version. Over 10 million people visit the Hershey Harrisburg Region annually and spend approximately $2.36 billion. Be seen by those visitors!